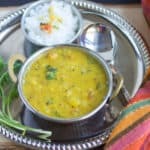 Manjal Sambar aka Turmeric Sambar – A quick and an instant sambar prepared with chickpea flour or besan with a lot of turmeric and fennel seeds and it is a perfect side for idli, dosa, upma, and even roti. 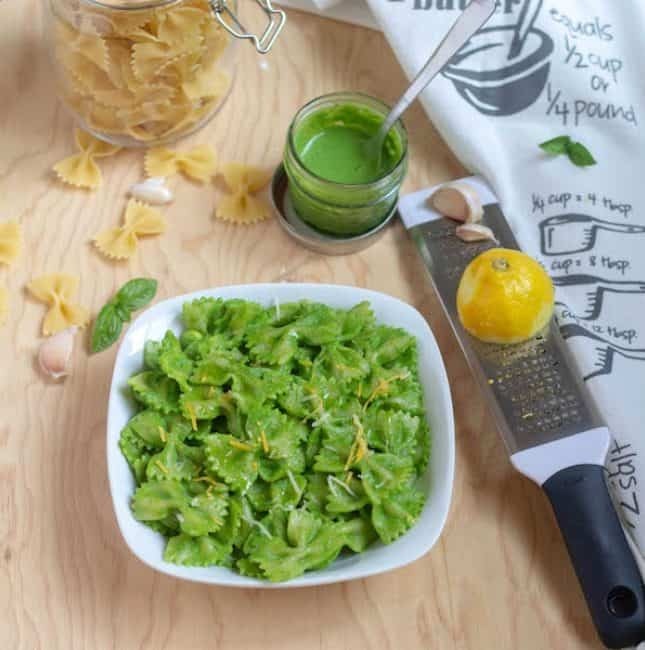 Check out this simple yet flavorful recipe with a detailed video. I am happy to announce the next kid’s delight event. In 2015 I picked pasta for kids as the theme, in 2016 it was cakes and cookies, and last year it was soups and stews. 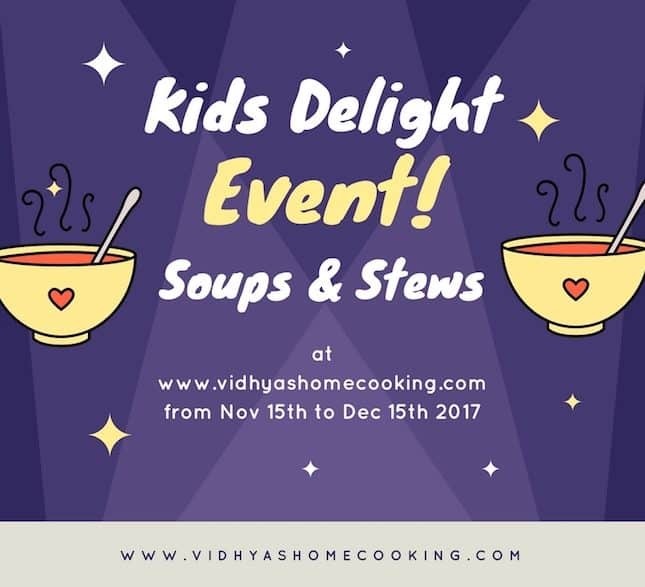 This time I went with a broad category and, the theme is “Kids friendly recipes with veggies sneaked in.” Check out the details about the event and also how you can participate in this same. 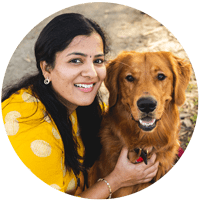 Today I am sharing a round-up of all the delicious and healthy vegetarian kids friendly recipes that can be prepared quickly on the busy mornings. 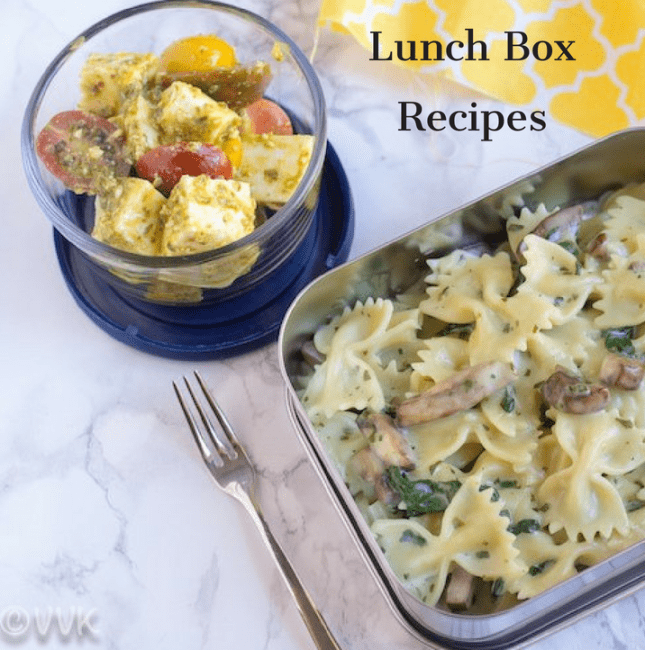 If you are looking for kids friendly lunch box recipe collection, then you are at the right place. Check all the A to Z lunch box recipes that I posted in April. After posting two homemade pizzas from scratch, today I am going to share an easy peasy semi-homemade pizza (errr you can make this from scratch as well) prepared with bread. It’s the bread pizza topped with tomato-pesto sauce, vegetables and of course cheese. 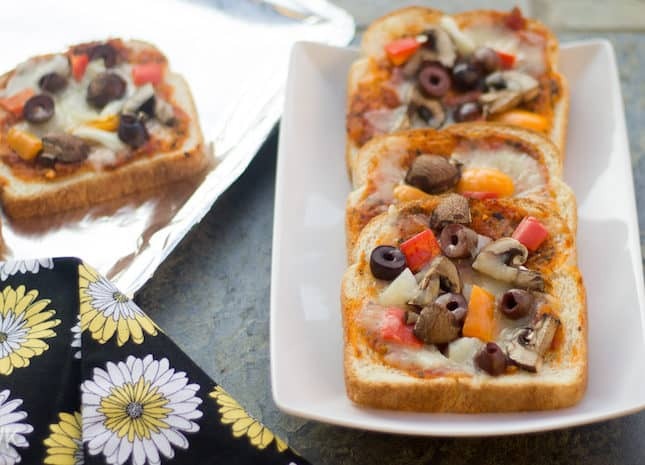 This bread pizza is a perfect after-school snack, or if you ask me, I would say its a ideal dinner/lunch too. 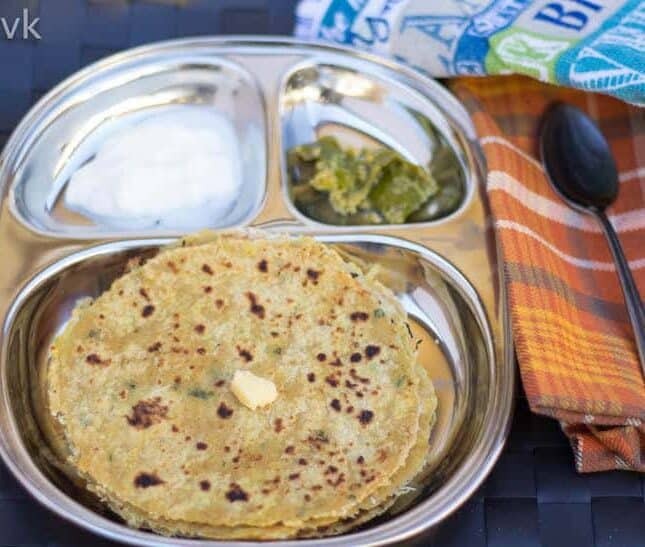 The third recipe that I am going to post under the theme, lunch box recipes is the Coin dosa, precisely Carrot Coin Dosa. 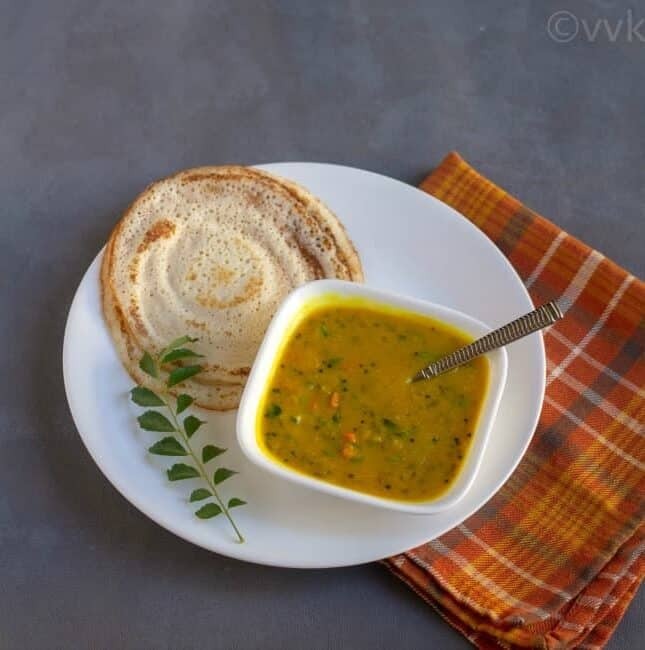 With idli/dosa batter, you can make zillion recipes, and one among them is the carrot dosa. As kiddo likes mess-free, grab and go dishes, I prepare small dosa like coins and hence the name. He calls this kutti dosai. 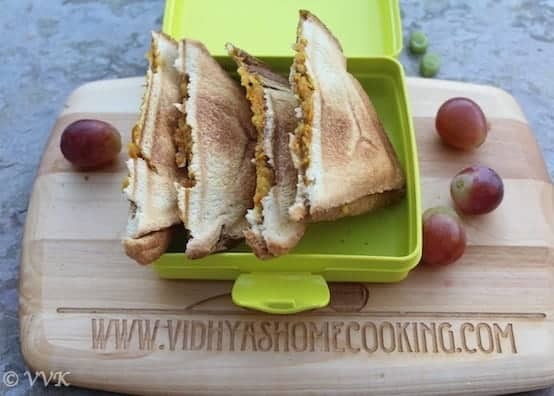 Today I am going to share yet another lunch box recipe with a veggie sneaked in. 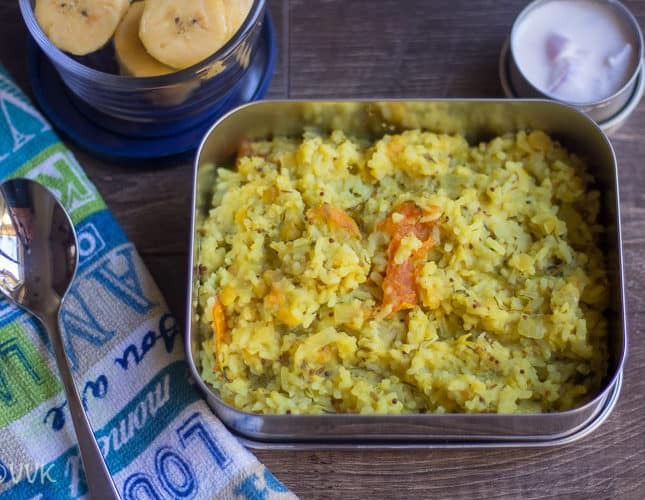 :-) Yesterday I posted ridgegourd rice, and today it’s the protein-rich – mushroom paniyaram – a delicious and mess-free lunch box recipe that vaandu loves. 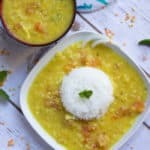 I usually use different rice, dal proportion for paniyaram batter (you find it here) but for this recipe, I did not use the paniyaram batter instead, I went with my regular idli/dosa batter. Check out the simple recipe below. 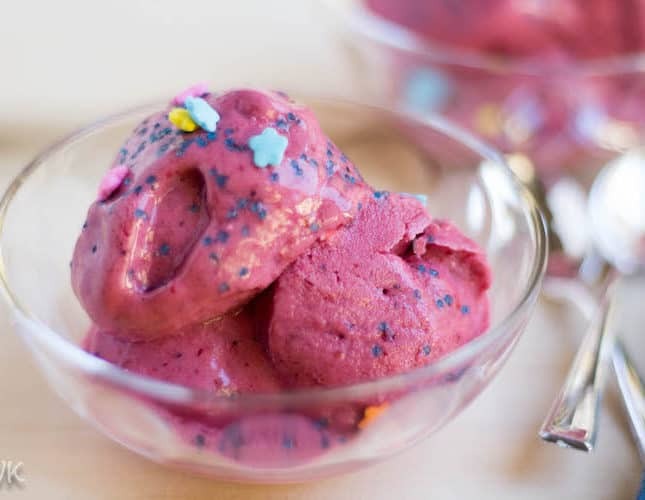 Mixed Berry Froyo is a delicious frozen summer treat rich in antioxidants and probiotics. This froyo is a no-churn simple recipe, and it can be prepared without an ice-cream machine. Froyo is nothing flavored frozen yogurt. You can add your favorite flavors which could be anything from frozen fruits to liquid flavors like vanilla or rose syrup. This time I went with mixed berries to prepare this vibrantly mixed berry froyo. These froyos are great way sneak in the fruits. 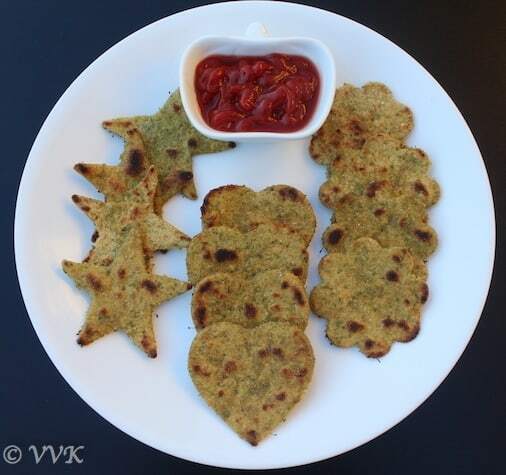 Earlier I posted two healthy, diabetic friendly recipes under the holi recipes theme. Today I am going to post a sinfully sweet and delicious kulfi recipe. The ice-cream is the combination of blanched almonds, condensed milk, pistachios, kesar, milk, and cream. How can it go wrong? No way right? 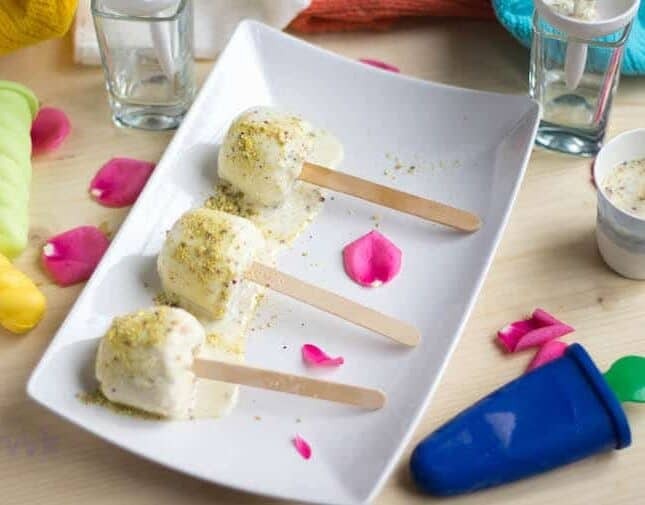 Here comes the gorgeous, kids friendly Almond Kulfi recipe. 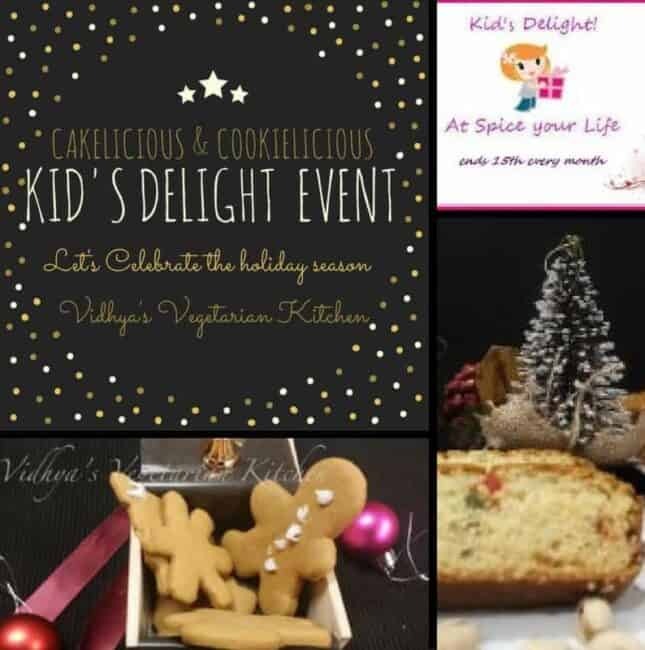 Here is the much-awaited roundup post of the kid’s delight event – Cakes and Cookies. I hosted the event during the holiday season. 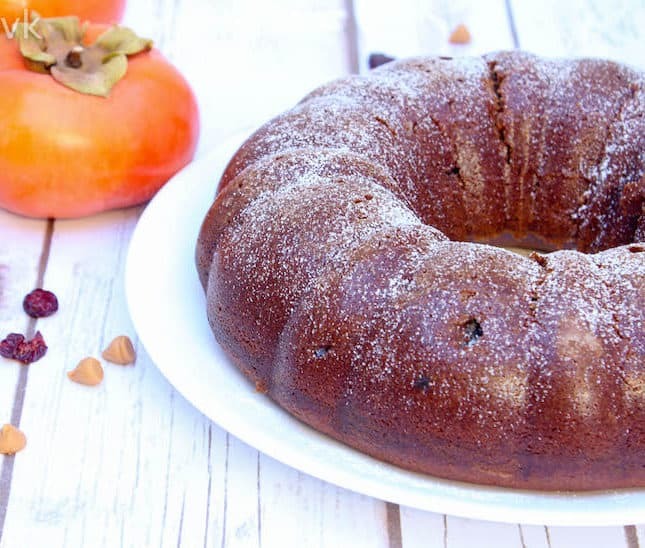 I know it’s the perfect time for cakes and cookies but at the same time, it is the time for traveling and family visits. 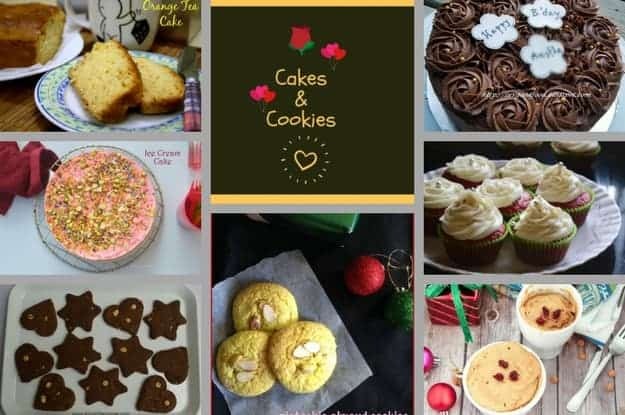 Irrespective of that, I received 29 lip smacking yummylicious recipes. 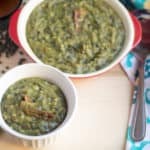 Thanks to each and everyone for making this event a great success and without any further ado here is the recipe roundup. I love breakfast smoothies. I bet everyone has crazy mornings and if you want to prepare a healthy breakfast but within 10 minutes, smoothies are your best bet. 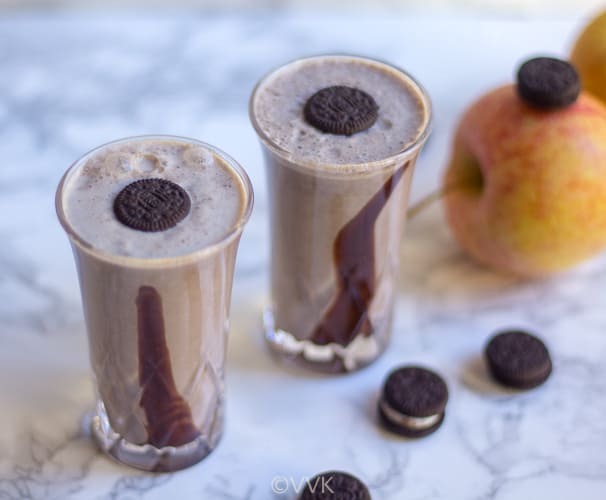 Today I am going to share a simple smoothie made with readily available ingredients. 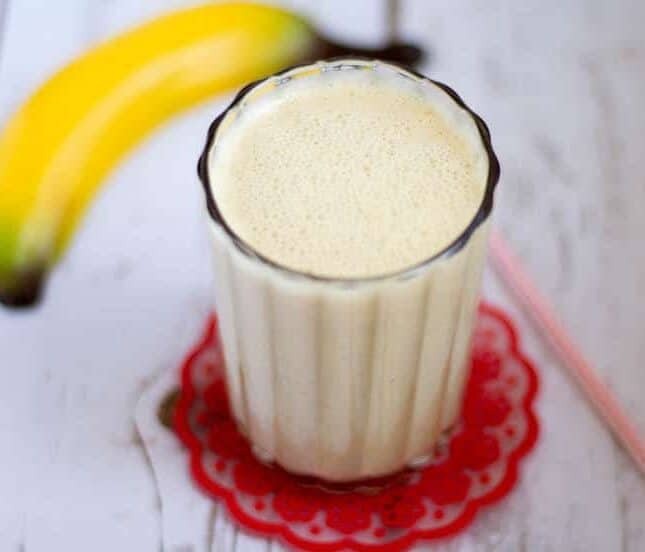 All you need is milk, banana, peanut butter, and sugar to prepare this glass of goodness. 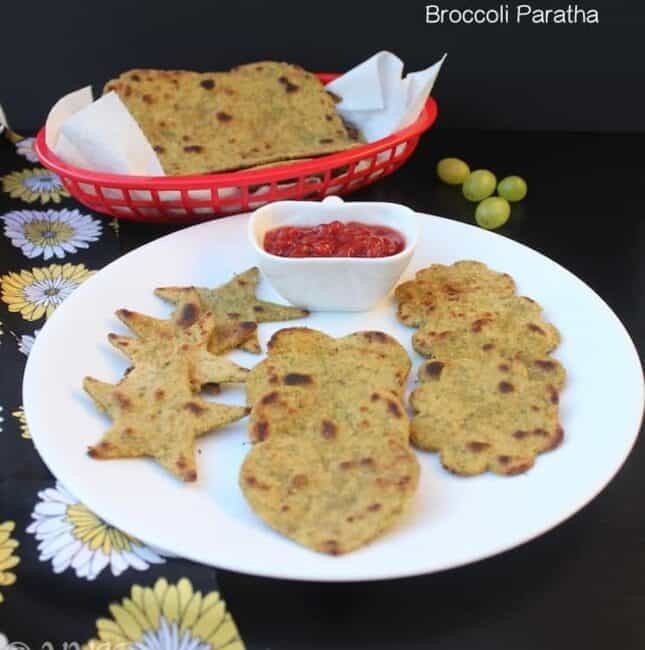 Today I am going to share a healthy paratha recipe prepared with white radish, popularly known as Mooli ka paratha or muli paratha. When kiddo is not eating a particular veggie in the form of dry curry or kootu, I always look out for other ways to incorporate the same in his diet. Parathas and dosai are always my go to options. So here comes my mooli ka paratha. 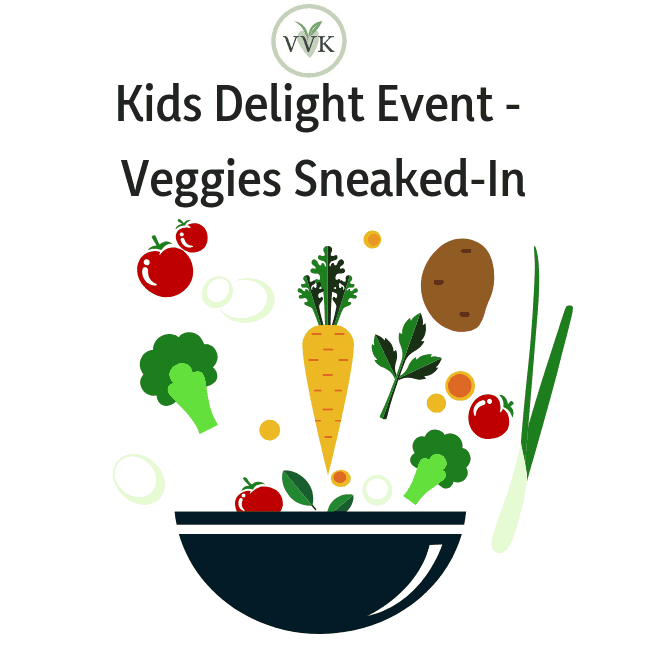 I am happy to announce the next kid’s delight event. Last year, I picked pastas for kids. This year I am going with cakes and cookies. Holiday season always calls for baking. Bake your child’s favorite cakes or cookies and please join me with your entries. Let’s make this holiday season more fun and cookielicious and cakelicious. Please send in your recipe link along with the picture to my email @ [email protected] I will be doing a round up post before Jan 25th. 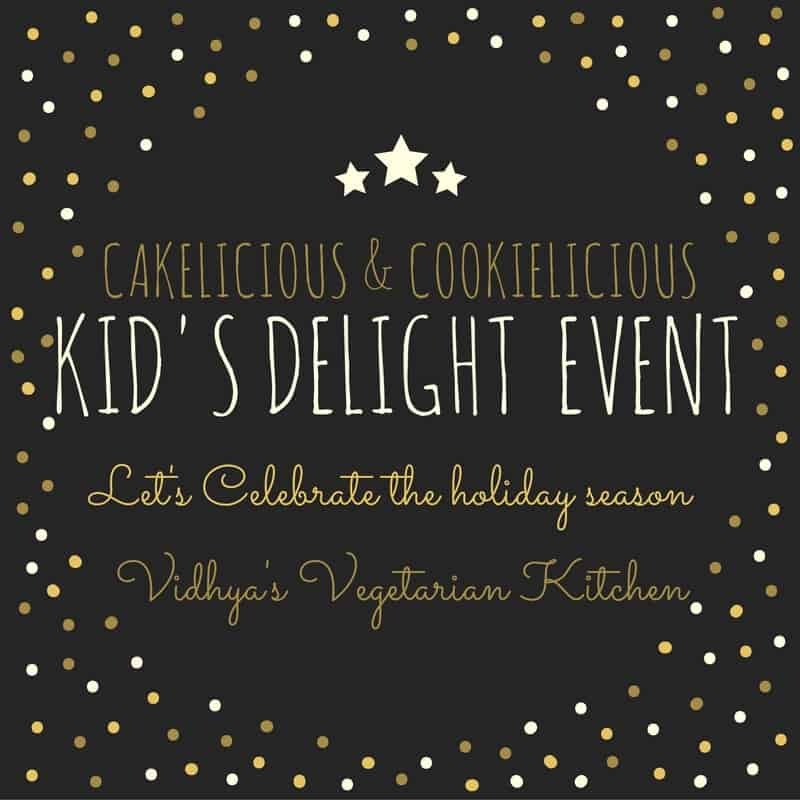 From now until January 15th, you are welcome to join the “Kids delight event | Cakes and Cookies” that will make a kid happy! The recipe has to be posted between Dec 15 2016 and Jan 15th 2017. Sorry I am not accepting from the archives. Kindly link up this event announcement(this post link) and Valli’s Kid’s delight announcement to qualify as an entry. If you can use the below logo, it will be great. Looking forward to your cakes and cookies. Thanks a lot. Sweet Potato Chaat or Shakarkandi ki Chaat is a super simple recipe and it is great alternative to the popular aloo chaat. 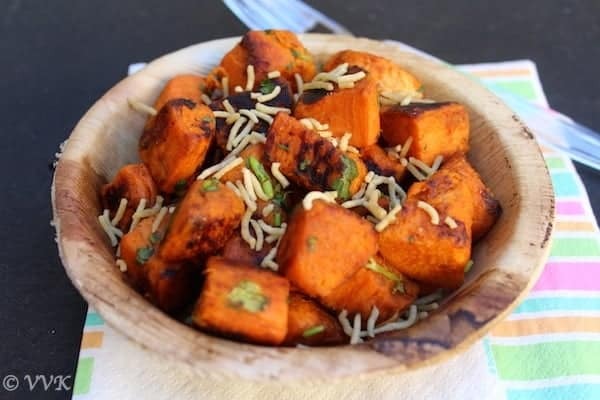 If you want to avoid potatoes and looking for alternatives, here comes the sweet potato chaat. For aloo chaat, we usually roast or fry the potatoes and toss it with chaat masala and add in the toppings and serve with the dash of lime juice. It’s as simple as that. But for this sweet potato chaat, I boiled them first and cubed them, then tossed them with spices and pan seared until the caramelized crust is formed, making it a guilt free yummy chaat. It’s September and its the Mega Marathon Month. :-) Welcoming you all to this Cooking Carnival. Guess what theme I picked for this entire month? It’s the Chaat / Appetizers / Snacks. 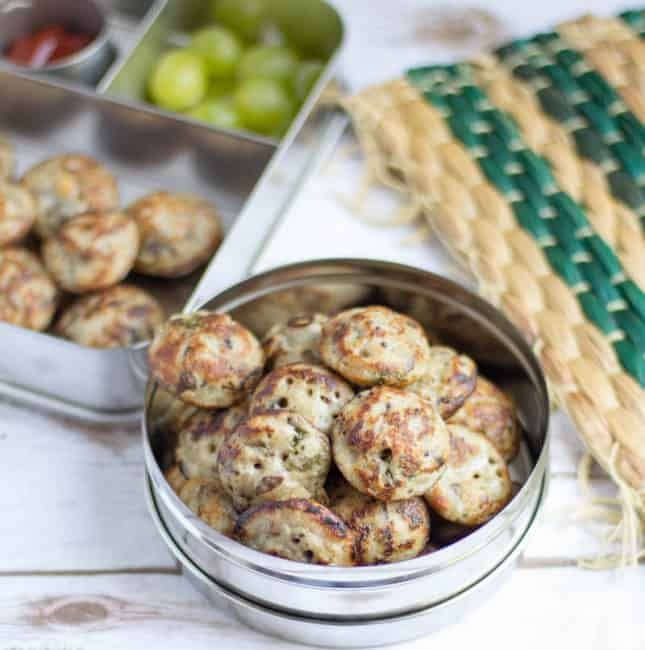 So starting today and for next 30 days, I will be sharing kids friendly (yes kids friendly too, I will be sharing how I serve these chaats for Vaandu) yummylicious, lip smacking, sweet and spicy, savory snacks and chaats from all over India. I hope you all enjoy and I am looking forward to hear your thoughts and comments. 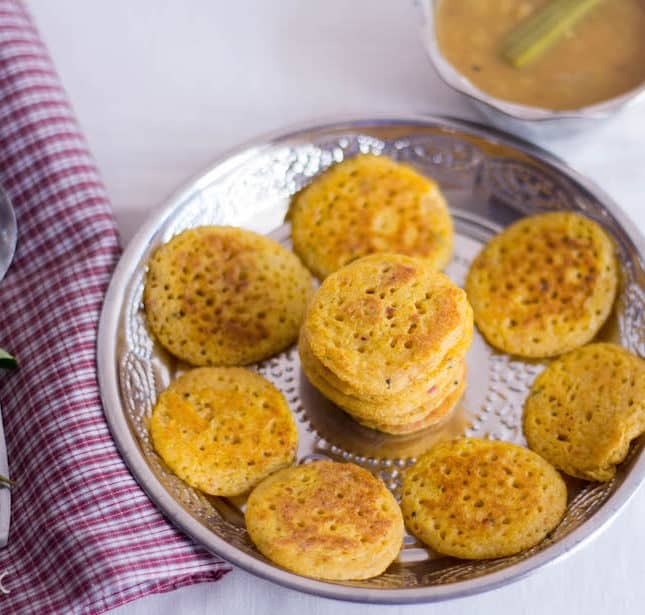 The first chaat recipe that I am going to post for this marathon is Cutlets – these deep fried or shallow fried goodies are perfect tea time snack. It is pretty much similar to tikkis. Like many other recipes, cutlets can be prepared in zillion ways. 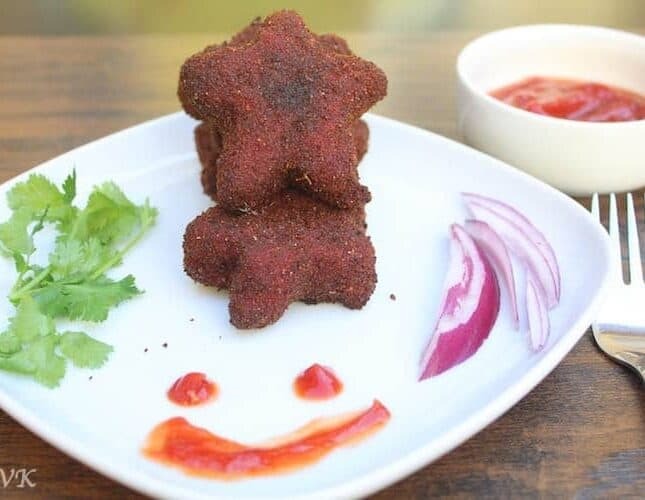 But here is my super simple kid’s friendly deep fried beet root cutlet. Cutlets are perfect recipe where you can sneak in any veggies. With cookie cutters you can try different shapes and wow your kids and everyone. 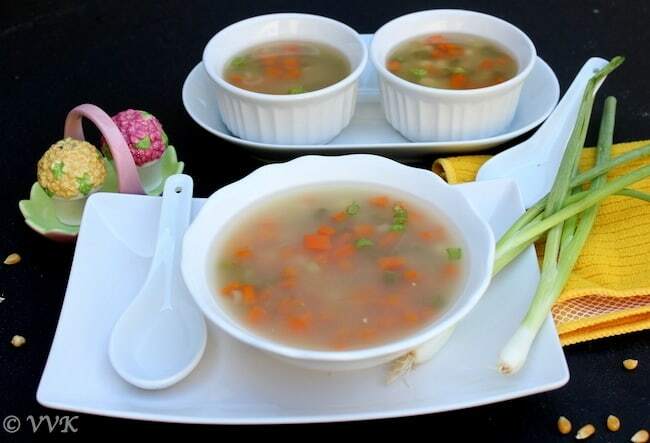 Sweet Corn Vegetable Soup – pretty much all the Indian restaurants have this soup in their menu. 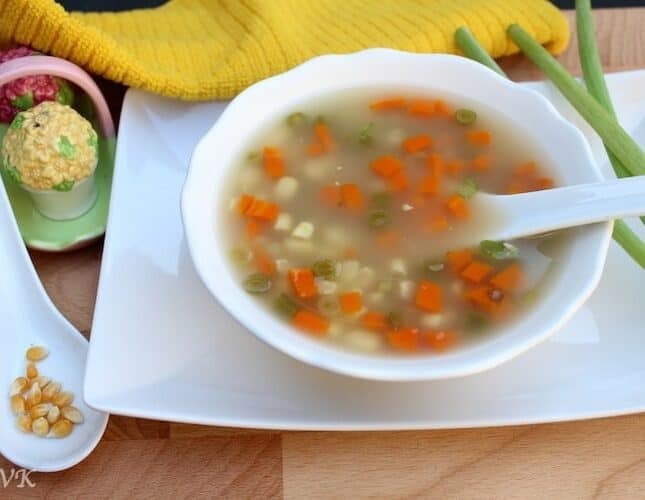 This simple yet delicious clear soup is not only kids’ delight, its pretty much everyone’s delight. 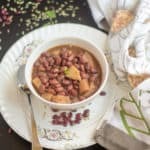 In a quest to sneak in vegetables, I have tried lot of soup recipes and here is one such simple recipe which is prepared in a crockpot. This recipe can be easily prepared in a stove top also. 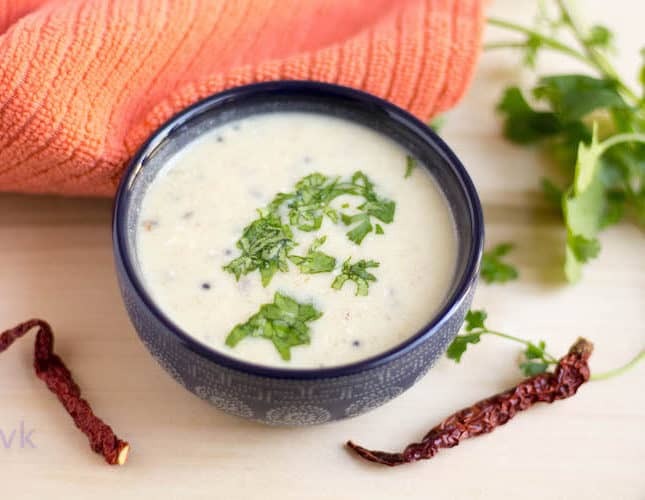 This simple recipe can be modified in a zillion ways according to your preference. 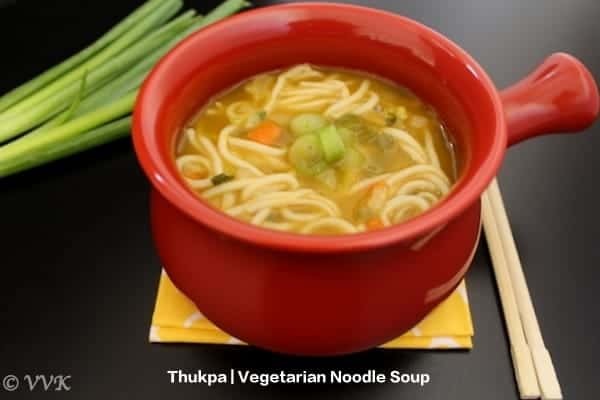 Thukpa is one among the popular noodle soups in India. 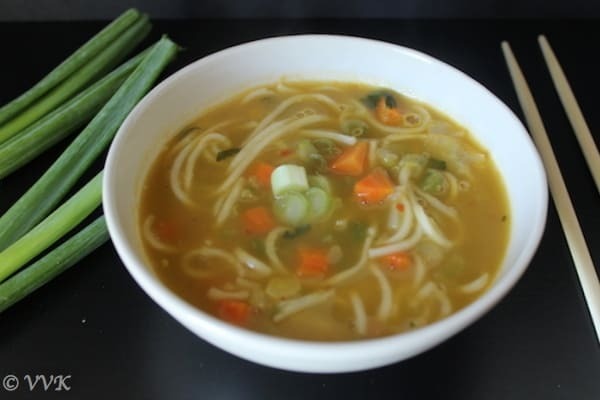 Thukpa is actually a Tibetan Noodle Soup and according to Wiki, “It originated in the eastern part of Tibet. The dish became popular in Nepal, Bhutan, and the states of Sikkim, Assam, and Arunachal Pradesh in Northeast India. 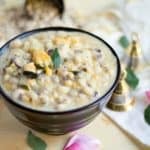 It is also popular in the Ladakh region and the state of Himachal Pradesh.” I cross posted this recipe earlier at Indian Moms Connect and this recipe was sent as a part of the July Month Treasure Box. 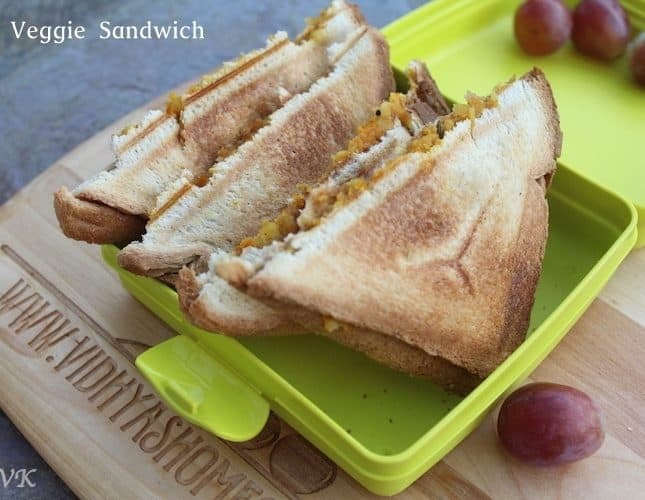 Sandwiches are one of the perfect lunch box recipes. Jam and bread or Peanut Butter Jelly sandwiches are my to go options on super busy days or super lazy days too. ;-) But here is a savory sandwich prepared with potatoes and carrots. The filling or the stuffing can be prepared well ahead which makes your morning super easy.